Their families are sworn enemies…When Kiernan and Melina spent one passionate night together a year ago, they never thought that it would change their lives forever. While the attraction was undeniable, wolf shifter Melina Rodriguez knows it takes more than passion to combat a century of family animosity—even if she can’t manage to get dark, handsome Kiernan out of her head. But he won’t let her go.After a year of relentlessly pursuing the one woman he shouldn’t want, vampire Kiernan has finally convinced sweet, passionate Melina to give him one more chance. When their hot Miami night of flirtation is violently interrupted, he has to convince her to put her life in his hands. 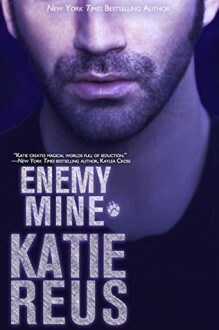 With an unknown enemy targeting her and their own families against their union, he knows he’ll have to show her that he’ll do anything to keep her safe. And he doesn’t care who gets in his way.Length: NOVELLAAuthor note: This novella was originally published elsewhere and is an updated and lightly re-edited version. This is my first Reus book and I am in love! Mix Romeo and Juliet with the supernatural and you have Enemy Mine! Perfect! And its a super quick read as well-you jump right into the action.